Who doesn’t love mashed potatoes? They compliment just about any food perfectly, they’re easy to make, and taste delicious. We make them everytime we have meatloaf or a nice steak, but they can go with just about anything. 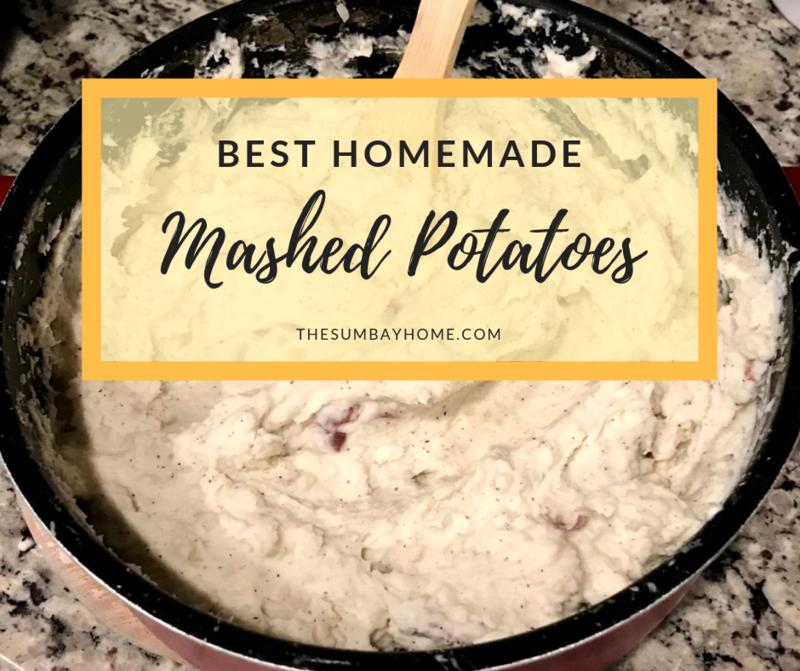 Everyone who tries these mashed potatoes says that they are some of the best they have ever had. If that’s true, why keep it a secret? Hope you enjoy these easy mashed potatoes as much as we do. *This page contains affiliate links to products I recommend. If you purchase something from this page, I may receive a small percentage of the sale at no extra cost to you. I only recommend products and services I use and truly believe will help you. We also have a Quick and Easy Homemade Chili Recipe that you’ll love, check it out here! I personally use red-skinned potatoes, but feel free to use whatever you like. In the past, I used to just get whatever potatoes were on sale at the grocery store. But after using red skin potatoes a few times, that’s the ones my family started to prefer. I suggest red skin but don’t feel obligated. Wash the skin of the potatoes thoroughly, especially if you plan to use the skin (which I would recommend). If you want to take the skin off your potatoes, now is the time. 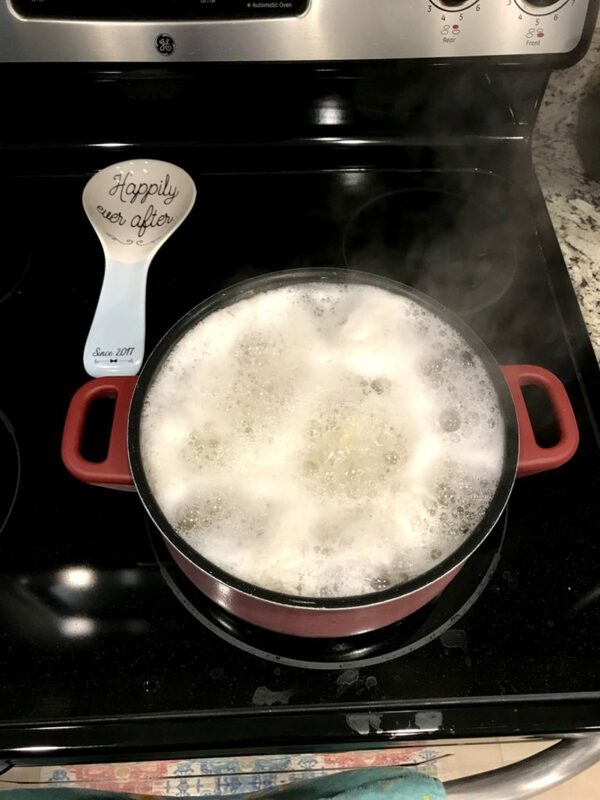 Just use a potato peeler and clean them up. But you don’t have to peel them, I actually prefer the taste of the skins left in my mashed potatoes. Bonus tip: Leaving the skins on will save you some time! Start by trimming off any part of the potato that you’re not comfortable with. Some of them have some deep folds that I cant clean very well while washing. Those are the first to go for me, also be sure to cut off any sprouts if they are any. Check out, Is it safe to eat sprouted potatoes? if you are curious. Next, dice the potatoes into smaller cubes to help them cook faster. I try to get mine around 2 x 1 inch pieces. Red potatoes are fairly small, so I usually end up quartering the large ones, and cutting the small ones in half. After cutting the potatoes, load them up in a large stockpot and cover the potatoes with water. Cook them, starting on high heat for 30 minutes. Once they start to boil rapidly, slowly reduce the heat to prevent them from boiling over. Keep an eye on these while cooking. I usually have to add a little bit more water about halfway through cooking the potatoes. But that’s only because my stockpot is not really big enough to cook 4/5 pounds of potatoes. 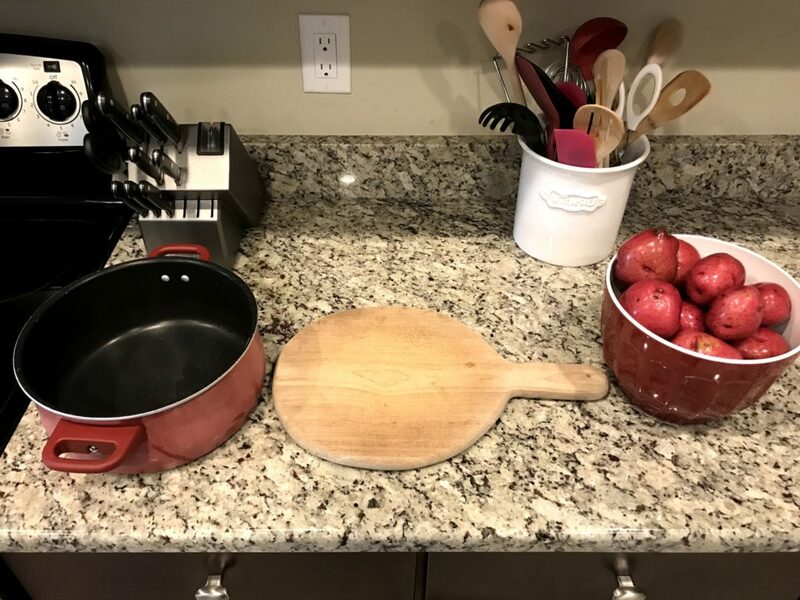 If you have a bigger stockpot (<– like this one), cover the potatoes with an extra inch or two of water and you shouldn’t have to worry about that. 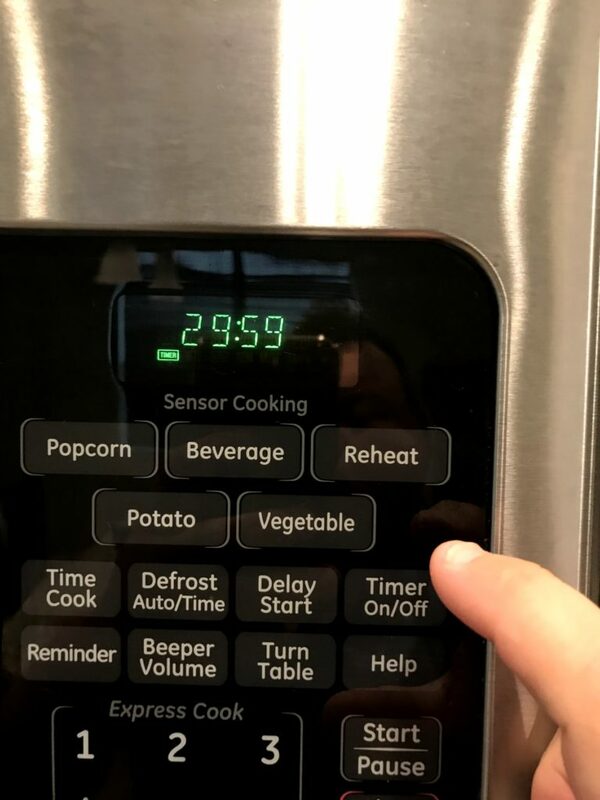 The extra water will extend your cooking time by a few minutes though. 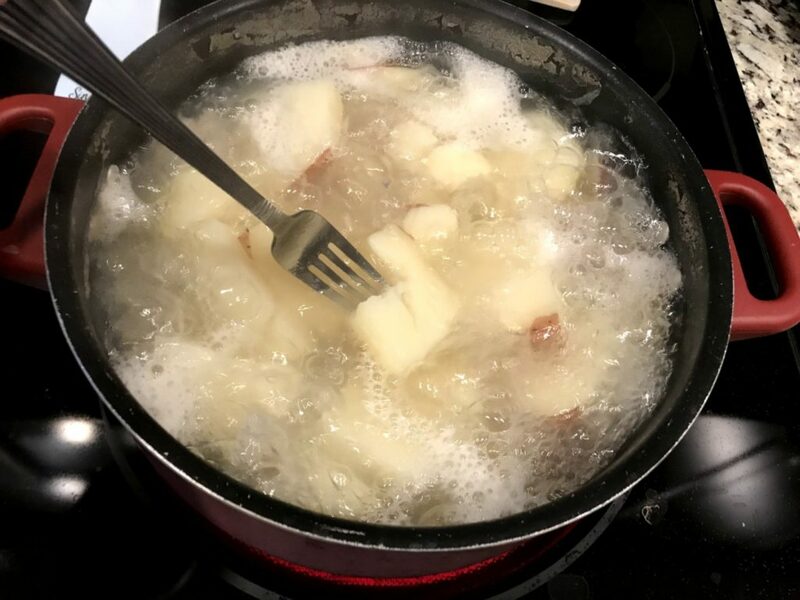 After cooking the potatoes for 30 minutes, use the fork test to make sure they are cooked. When using the fork test, the fork should slide into the potatoes very easily. It should feel like a knife slicing through a soft stick of butter (basically no resistance). If you feel any resistance (or a slight crunch) keep boiling the potatoes. 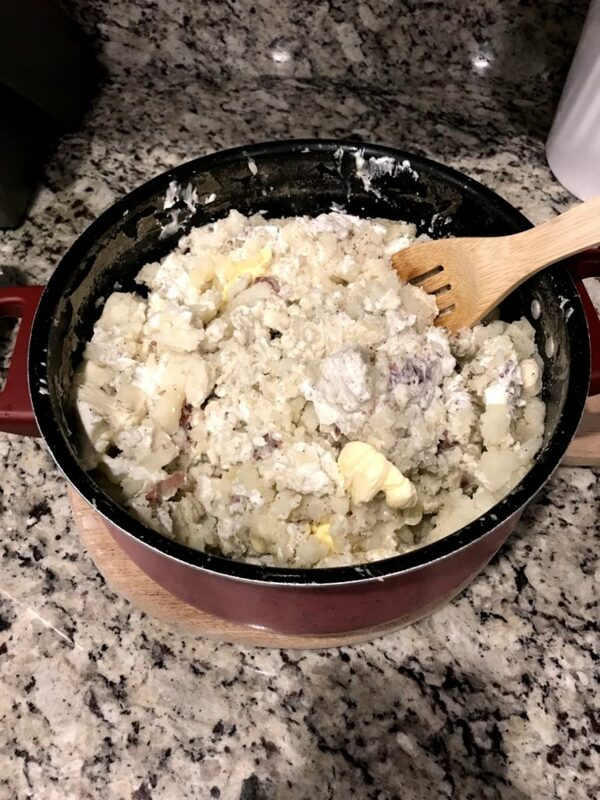 You don’t want the potatoes so soft that they are breaking up in the water. If you notice this, stop and drain the water. Use the fork test to see if the potatoes are ready for mashing! Once the potatoes are cooked, drain them and return to the stockpot you cooked them in. 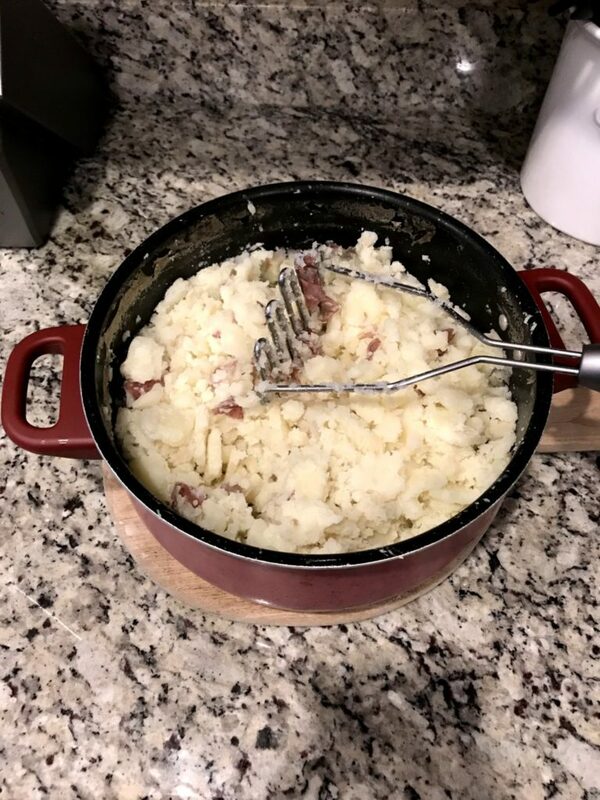 Once you get the potatoes back into the stockpot, start mashing them using a potato masher. You can also use a KitchenAid mixer for this if you have one. It doesn’t take very long by hand, so I personally use that method. The mixer will give you a perfectly smooth consistency if that’s what you want. The hand mashing does pretty well, so feel free to give it a shot first. I only spend about a minute mashing the potatoes. keep moving in a circular motion and crush them all. Now it’s time to add in the extras and make these mashed potatoes taste delicious. The secret here is using a hefty amount of sour cream. It will make your mashed potatoes look and taste “creamy”. 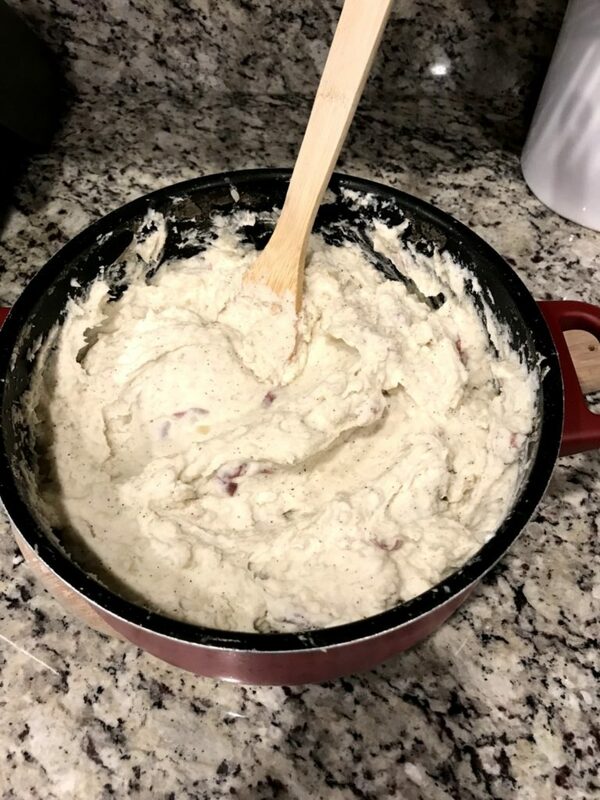 For 4 to 5 pounds of mashed potatoes, I use a 16 oz container of sour cream. And obviously, half that amount if I’m making half as much mashed potatoes. salt and pepper to taste – I use a tablespoon of each, but I would suggest starting with half that amount and add more if needed. Once you have everything in there, you just need to mix it all together. You can do this using a wooden spoon or your mixer. It will only take a minute or two either way. Now you’re ready for a little taste, to see if you need to add any extra salt or pepper. If it tastes good, they are ready to serve, enjoy! Ok, these mashed potatoes are ready to serve. If you’re not ready to eat them just yet, you can keep them covered for about 30 minutes without having to reheat. Enjoy! Serve them up any way you prefer. We like to make these when we have steaks or meatloaf, but they will go with just about anything. When was the last time you had Shepherd’s Pie? These mashed potatoes would go perfectly in this classic recipe as well. Wash potatoes thoroughly. Cut off any dark spots or sprouts, and peel (only if desired, not necessary). Then cut potatoes into 2 X 1 inch pieces. 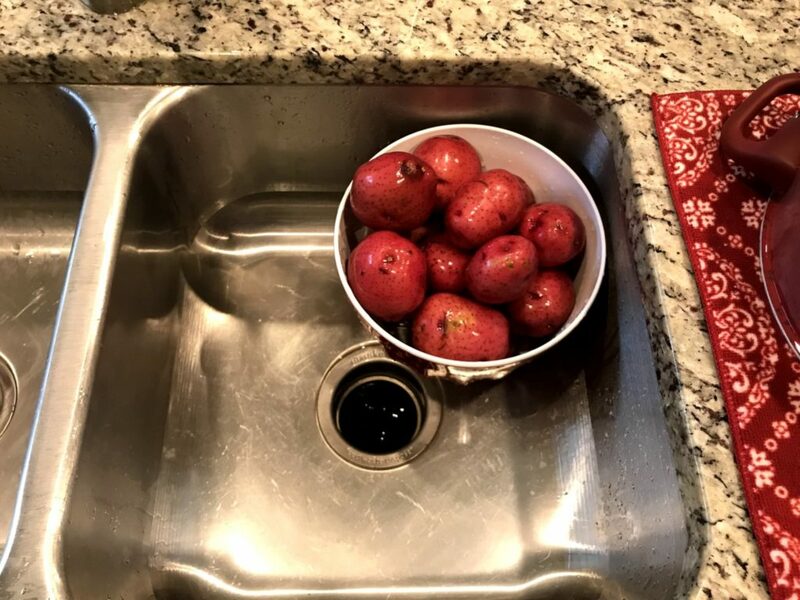 Since red potatoes are small, you can quarter the larger ones and half the smaller ones. 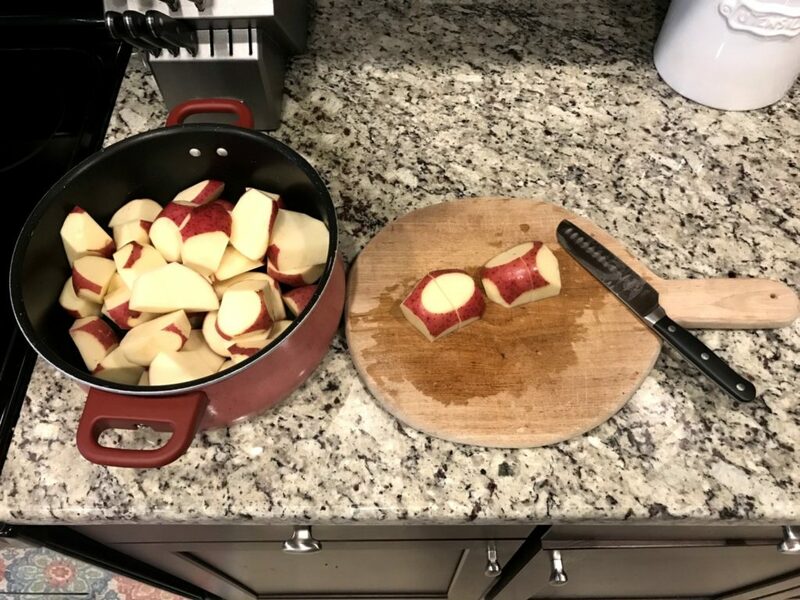 Put cut pieces into a large stockpot and cover potatoes with water. Boil for 30 minutes or until they are fork tender. Fork Test: When the potatoes are done, you will be able to poke them with a fork and feel no resistance. If there’s any resistance, keep cooking. 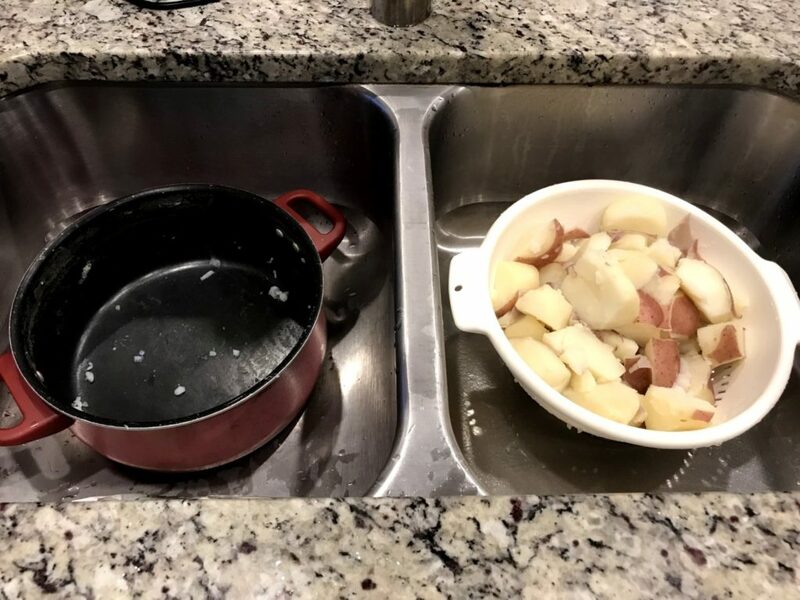 When potatoes are done, drain and return them to the stockpot. Mash the potatoes using a potato masher, for a minute or two. Make sure there are no remaining lumps. Add the sour cream, parmesan cheese, butter, salt, and pepper. Start with a small amount of salt and pepper, like a teaspoon of each. Mix the potatoes thoroughly using a sturdy wooden spoon, then taste. Add more salt and pepper if desired (in small increments), stir thoroughly, and taste again. Reminder: Salt and pepper can be added to an individual portion if you have someone who prefers more than others. Enjoy, you can keep them covered for about 30 minutes (if necessary) without having to reheat them before serving. 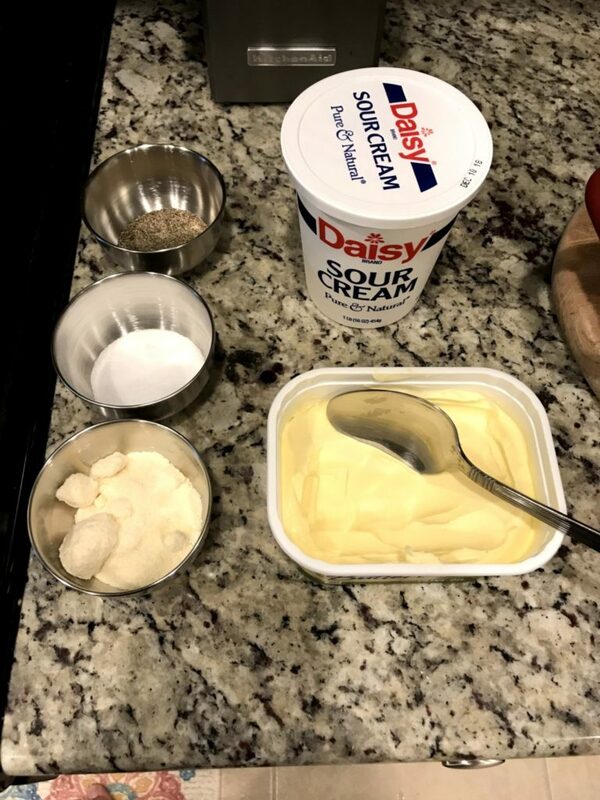 Cut all of the ingredients in half and follow the same cooking directions if you’d like to make a smaller portion of these Mashed Potatoes. We hope you enjoy this recipe, please feel free to save it for future use and share it with anyone you would like. 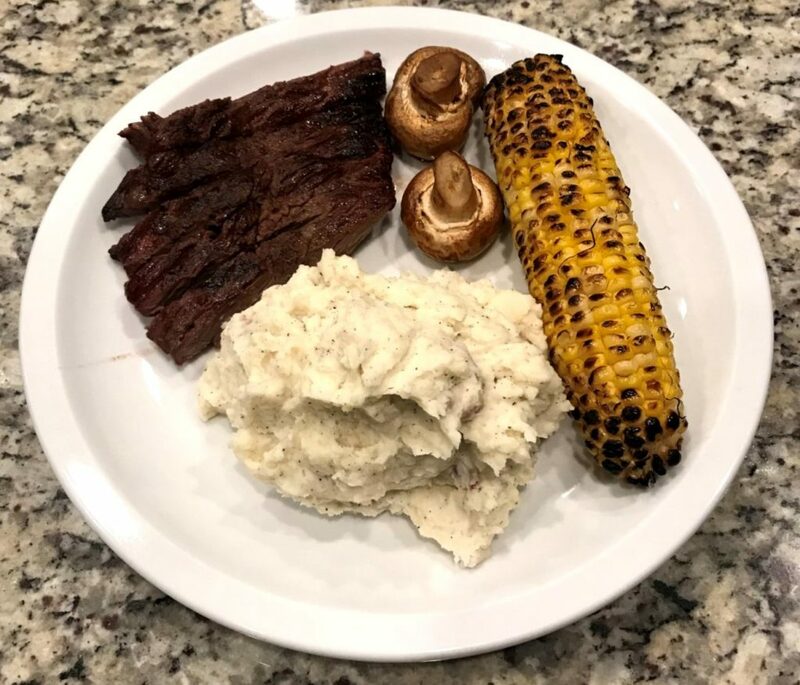 Let us know if you have a favorite ingredient(s) you like to put in your mashed potatoes in the comments section below. Looking for a great Chili recipe? Check out our Quick and Easy Homemade Chili!